Hour-After-Hour* relief of monthly water weight gain, bloating, and water retention. DIUREX WATER CAPSULES contain a gentle and effective diuretic to help relieve monthly water weight gain, bloat, puffiness, swelling, and related discomforts. Each easy-to-swallow DIUREX WATER CAPSULE releases hundreds of tiny, quick dissolving, medicated beads for extended, caffeine-free relief*. Trust DIUREX -- the #1 Best-Selling† brand of over-the-counter diuretic water pills to give you the prompt relief you need when you need it. *Relief extends for up to 6 hours. 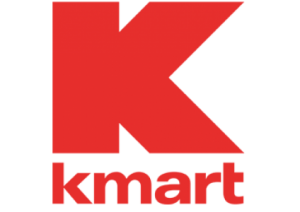 †Based on independent syndicated market research. 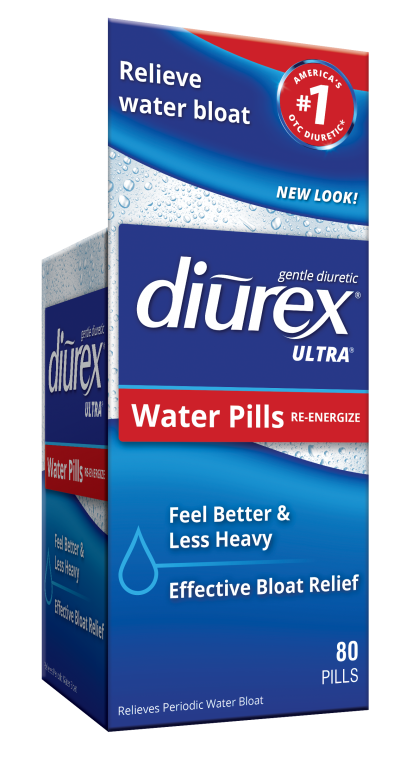 What are DIUREX WATER CAPSULES used for? DIUREX WATER CAPSULES help relieve temporary water weight gain, bloating and other discomforts associated with the premenstrual and menstrual periods. 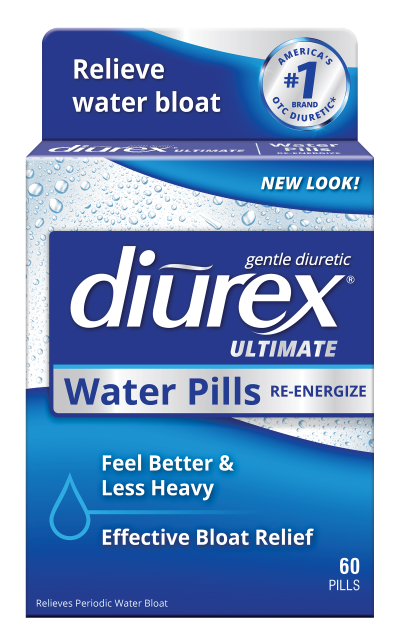 What is the active ingredient in DIUREX WATER CAPSULES? Each DIUREX WATER CAPSULE contains 50 mg of Pamabrom. Pamabrom is a mild diuretic ingredient that is similar to caffeine. It has the water-relieving activity of caffeine, without the stimulation of caffeine. What is the dosage for DIUREX WATER CAPSULES? 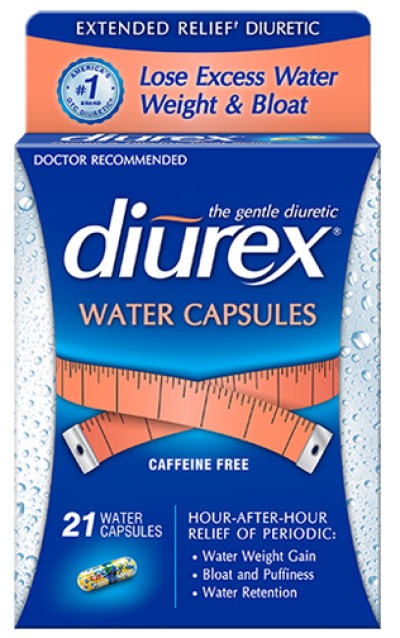 The dosage for DIUREX WATER CAPSULES is one capsule after breakfast with a full glass of water. Dose may be repeated after 6 hours, not to exceed 4 caplets in 24 hours. Be sure to read all product package label Directions, Uses and Warnings and follow them carefully. 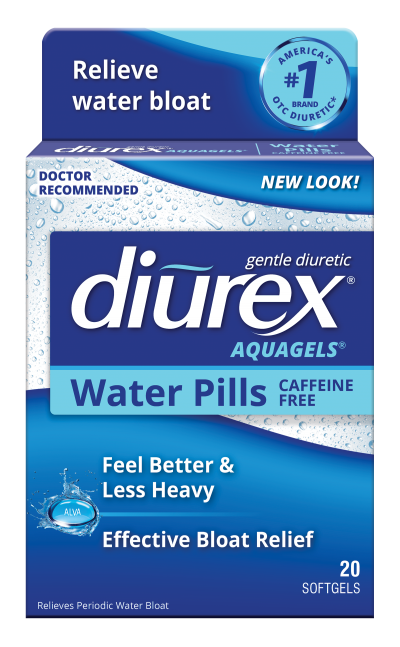 Do DIUREX WATER CAPSULES contain any sulfa drugs? DIUREX WATER CAPSULES help relieve temporary water weight gain, bloating and other discomforts associated with the premenstrual and menstrual periods. We recommend that you ask your doctor or pharmacist before using DIUREX for a purpose other than that indicated on the product package labeling and follow his or her advice. Do DIUREX WATER CAPSULES "clean out your system"? Can I use DIUREX WATER CAPSULES continuously? DIUREX WATER CAPSULES help relieve temporary water weight gain, bloating and other discomforts associated with the premenstrual and menstrual periods. The product package labeling states that you should not use DIUREX for more than 10 consecutive days without consulting your doctor. Can I use DIUREX WATER CAPSULES to remove the swelling in my feet and ankles? 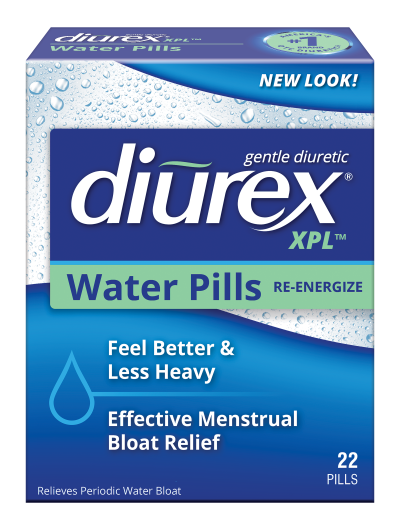 DIUREX WATER CAPSULES help relieve temporary water weight gain, bloating and other discomforts associated with the premenstrual and menstrual periods. We recommend that you ask your doctor or pharmacist before using DIUREX for a purpose other than that indicated on or in the product package labeling and follow his or her advice. Can I use DIUREX WATER CAPSULES with my prescription medication(s)? You should ask your doctor or pharmacist if you can take DIUREX WATER CAPSULES while you are using other medications. I don't have a period any more. Can I still use DIUREX WATER CAPSULES? Can a man use DIUREX WATER CAPSULES?